Even smoking just one cigarette a day is linked to major risk of heart problems, a new study suggests. Researchers said there is "no safe level" of smoking as they urged smokers to quit instead of "cutting down". The study found that smoking one cigarette a day was associated with at least a 48% increased risk of coronary heart disease (CHD) in men, as well as to at least a 57% increased risk of CHD for women. And both men and women who smoke just one cigarette a day have a 30% increased risk of stroke. Results of 141 studies were analysed by experts, led by researchers from the UCL Cancer Institute at University College London. 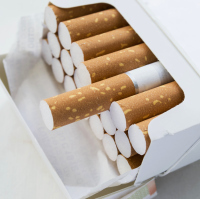 The experts then estimated the relative risks for smoking one, five or 20 cigarettes per day. They found that among men, half of the risk associated with smoking a pack of 20 comes from just the first cigarette. In women, a single cigarette accounted for about a third of the risk associated with one pack. "Aim to quit instead of cutting down"
The study, published in the British Medical Journal (BMJ), concludes that smoking one cigarette a day carries a higher risk than expected for CHD or stroke. "Smokers should aim to quit instead of cutting down to significantly reduce their risk of these two common major disorders," experts said. "Smoking only about one cigarette per day carries a risk of developing coronary heart disease and stroke much greater than expected: around half that for people who smoke 20 per day." "No safe level of smoking exists for cardiovascular disease." Taking a trip away? Don't forget to sort the travel insurance that suits you and your family.